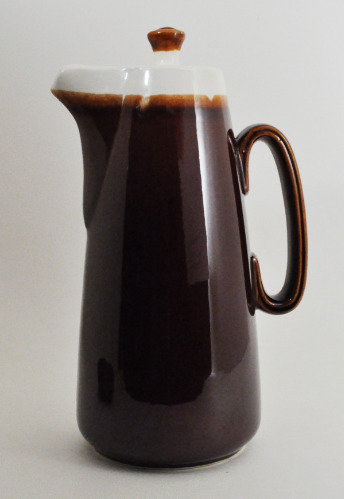 This tall brown drip coffee carafe pot with lid is in excellent condition. Great glaze all the way around with a notch and lock lid for easy pouring so the lid stays on and keeps the coffee warm. This is an 8 cup capacity so will hold a full 8 cup drip maker complete pot. No chips, cracks, or hairlines at all. Plainly marked Oven Proof USA on the bottom. A fine addition to your Brown Dripware Collection, Decor, and Serving. IMPORTANT SHIPPING NOTE: This will ship very carefully packed, double boxed, and USPS Priority Mail for faster and safe delivery to you.